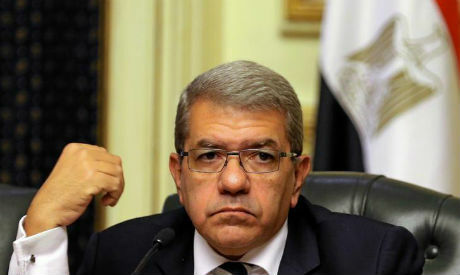 Egypt’s Finance Minister Amr El-Garhy presented the state’s draft budget for next fiscal year 2018-19 which begins July 1 to Prime Minister Sherif Ismail Wednesday, according to a statement from the Cabinet. The budget, valued at EGP 1.412 trillion, is set to be presented to the House of Representatives before 31 March. The draft 2018-19 budget sets a GDP growth target of 5.8 percent for fiscal year 2018-19, the highest in 10 years, according to the statement. GDP growth in the current fiscal year 2017-18 is targeted at 4.6 percent of GDP, compared to last year's target of 3.8 percent. The 2018-19 budget sets a target for total budget deficit of 8.4 percent of GDP, compared with 12.5 percent of GDP in fiscal year 2015-16. The budget deficit for the current fiscal year 2017-18 is targeted at 9.1 percent of GDP, compared with 10.5-10.8 percent last fiscal year. In January, Deputy Minister of Finance Mohamed Mait told Reuters that Egypt’s budget deficit is expected to reach 9.4 percent of GDP in fiscal year 2017-18. The government is targeting a primary surplus of 2 percent of GDP for fiscal year 2018-19 - primary surplus does not include interest payments on debt as expenditures. The 2018-19 budget also targets increasing revenues by 22 percent year-on-year compared with a targeted 15.5 percent increase in expenditures. This compares to a targeted increase in revenues in the current 2017-18 fiscal year’s budget by 29.6 percent year-on-year, and a 21.3 percent year-on-year targeted increase in expenditures. The target for the 2018-19 budget is also to lower public debt to 91 percent of GDP. The government is allocating EGP 149 billion to government investments in fiscal year 2018-19. Government investments include EGP 100 billion to curb the budget deficit, up from EGP 70 billion this fiscal year. Government investments will mainly be spent on infrastructure and basic services with a focus on Upper Egypt and border governorates, the statement said. The 2018-19 budget also increased the salaries’ allocation to EGP 266 billion, up from EGP 239.6 billion targeted this fiscal year. It also increases allocations to buy basic commodities and services to EGP 60 billion, up from EGP 51.6 billion targeted for this year. Allocations for social safety programs are set for EGP 332 billion, which is almost the same as this year’s target of EGP 332.7 billion. The Cabinet’s statement does not include the oil price per barrel and the exchange rate. In the current year’s budget, oil price was set at $55 per barrel, and the exchange rate at EGP 16 per dollar.